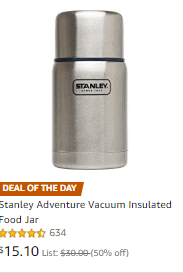 Through tonight only, there are some nice price drops on many of the Stanley Thermos and Insulated Food Jars. I love these products, we have been using them for years now and my husband has the Thermos that he takes coffee in to work, and it is still warm when he brings it home if he has not finished all the coffee. I use this insulated food one for my kids school lunch to send soups and noodles, and other warm foods, and it keeps things warm until their lunch time. These are definitely some good prices if your interested (and would make great gifts for anyone who likes to take coffee or lunch to school or work for the day)! There is a nice selection of items to choose from here. Remember Amazon prices can change at any time. 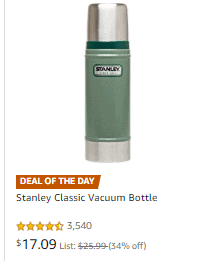 This is a one day deal for 12/18.